Chamomile has been used medicinally for thousands of years, and it is widely used in Europe. It is a popular treatment for numerous ailments. Chamomile, one of the most ancient and versatile medicinal herbs known to humankind. It primarily supports the nervous system and the integumentary system. Our Roman Chamomile, Anthemis nobilis, is harvested from the stems, leaves and blossoms in England as we found that particular source to possess the best balance of its helpful constituents while still delivering that cellular nourishment in a milder manner than German Chamomile, thus making it ideal for children or those with more fragile health conditions. It’s use for either of these body systems will bring with it a calming influence. Roman Chamomile essential oil also supports the nervous system and the integumentary system (the skin). In fact, your skin will LOVE some TLC with Roman Chamomile essential oil. While it performs much like German Chamomile on the body, it’s much milder than German Chamomile, thus making it ideal for those with sensitive skin. Children and those with more fragile health conditions also may prefer the milder Roman Chamomile version. It’s use for either of these body systems will bring with it a calming influence. The integumentary system of the body (the skin) LOVES Chamomile essential oil, particularly when there’s been a scrape or scratch or pesky bug bite or other mild irritation. But it also has a pleasant toning effect on the integumentary system and supports beautiful tone skin. That makes it a great addition to your nightly maintenance skin care regimen. The muscular system also enjoys the benefits of the Chamomile essential oil, especially when you’ve been overzealous and overextended. 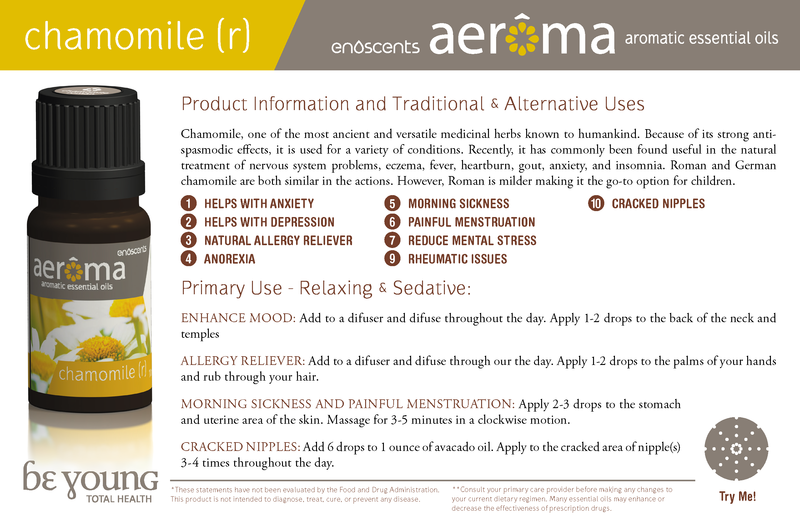 Be ready to enjoy the soothing, relaxing benefits with our premium Roman Chamomile essential oil! *These statements have not been evaluated by the Food and Drug Administration. This product is not intended to diagnose, treat, cure, or prevent any disease..
General: Chamomile has been used in baths, compresses, poultices, rinses, and semisolid preparations. Skin inflammation: German chamomile compresses have been applied on a wound for one hour twice daily for up to 28 days. Vaginitis: A douche of 30mL diluted chamomile in 500mL of water twice daily for 15 days has been used. Avoid during pregnancy, due to chamomile's possible menstruation and abortion stimulating effects. Use cautiously during breastfeeding due to the lack of research in this area. Botanic Name: Anthemis nobilis L.
protected from heat and light. does not contain any ingredient of animal origin or derived from animals. barley, oats or their hybridised strains and products of these. -Egg, unpasteurised egg and egg products. -Peanuts and products of these including oils. -Sesame seeds and products of these. POLYCYCLIC MUSK: Does not contain any polycyclic musk. NITRO MUSC: Does not contain any nitro musk. The interactions listed below are based on reports in scientific publications, laboratory experiments, or traditional use. You should always read product labels. If you have a medical condition, or are taking other drugs, herbs, or supplements, you should speak with a qualified healthcare provider before starting a new therapy. Antianxiety: Due to its pharmacological properties, chamomile may cause drowsiness and exacerbate the effects of sedative medications (44;​54). In human research, chamomile ingestion reduced mean anxiety scores in individuals with generalized anxiety disorder (GAD) compared to placebo (48;​50;​79). An extract of chamomile is apigenin, which has been shown in mice to have central benzodiazepine receptor affinity and anxiolytic and sedative effects (55). A lyophilized infusion of chamomile administered intraperitonealy in mice displayed a depressive effect on the central nervous system (78). In a case series intending to examine the cardiac effects of chamomile, the authors observed that 10 out of 12 patients undergoing cardiac catheterization fell asleep shortly after drinking chamomile tea (44). However, there is limited evidence supporting the sedating effects of chamomile. In human research, significant between-group differences in sleep measures were lacking after chamomile treatment (80). Antiarrhythmic: Apigenin, a constituent of chamomile, was found to increase the atrial rate in rats (65). Antiasthmatics: Chamomile may cause bronchial constriction, inflammation of the upper respiratory tract, dyspnea, asthma, and shortness of breath (121). Antibacterials: In vitro, chamomile had antimicrobial properties (1;​67;​70;​126;​127;​128;​129;​130;​131;​132;​133;​134). Anticoagulants and antiplatelets: Due to its coumarin content, chamomile may theoretically increase the risk of bleeding when ingested concomitantly with anticoagulant herbs or supplements (54;​69). In one case report, concurrent use of ingested and topical chamomile products while using anticoagulants led to multiple internal hemorrhages (70). Antidepressants: In human research, chamomile ingestion in individuals with Generalized Anxiety Disorder (GAD) decreased depression subscores compared to placebo (56). Antidiarrheals: Chamomile is a popular home remedy for gastrointestinal complaints. In human research, children treated with Matricaria recutita L. showed a reduction in the duration of diarrhea and stool frequency (85). In other research, the effects of chamomile alone remain unclear (51;​135). Antihistamines: In animal research, a single oral administration of German chamomile flower extract showed antipruritic effects (11). Furthermore, the antipruritic effects of H1 antagonists, oxatomide and fexofenadine, were remarkably enhanced by the combined administration of the ethyl acetate extract of German chamomile. Anti-inflammatory: In vitro and in animal research, chamomile had anti-inflammatory properties (4;​67;​136;​137;​138;​139;​140). In human research, skin lesion healing time was significantly reduced in individuals treated with topical chamomile (83), while some trials report a lack of between-group differences in response rate (52). Antilipemics: In animal models, chamomile had some cholesterol-lowering activities (90). Antimicrobials: In vitro, chamomile had antimicrobial properties (1;​51;​67;​126;​127;​128;​129;​130;​131;​132;​133;​134). Antioxidants: In vitro, chamomile had moderate antioxidant activities (90). Antispasmodics: In vitro and in animal research, alpha-bisabolol, apigenin, and farnesol in chamomile were considered spasmolytic (66;​67;​68). Antiulcer and gastric acid-reducing agents: In vitro, chamomile inhibited the induction of gastric ulcers (62). CNS depressants: A lyophilized infusion of chamomile administered intraperitonealy in mice displayed a depressive effect on the central nervous system (78). Diuretics: In animal research, chamomile flowers had diuretic properties (141). Gastrointestinal agents: Children treated with Matricaria recutita L. showed a reduction in the duration of diarrhea and stool frequency (85). When taken in large doses, chamomile has the potential to cause emesis (67). In human research, chamomile ingestion resulted in gastrointestinal discomfort (50;​56;​80). Hormonal: Chamomile may have anti-estrogenic effects and interact with herbs and supplements, such as red clover or soy (27). Hypoglycemics: In laboratory study, the flavonoid glucoside chamaemeloside found in Chamaemelum nobile has in vivo hypoglycemic activity comparable to free 3-hydroxy-3-methylglutaric acid (HMG) (63). Hypotensives: In animal research, apigenin, a constituent of chamomile, had hypotensive properties (64). Phytoestrogens: Chamomile may have anti-estrogenic effects and interact with herbs or supplements, such as red clover or soy (27). Sedatives: Due to its pharmacological properties, chamomile may cause drowsiness and exacerbate the effects of sedative herbs or supplements (44;​54). In human research, chamomile ingestion reduced mean anxiety scores in individuals with generalized anxiety disorder (GAD) compared to placebo (48;​50;​79). An extract of chamomile is apigenin, which has been shown in mice to have central benzodiazepine receptor affinity and anxiolytic and sedative effects (55). A lyophilized infusion of chamomile administered intraperitonealy in mice displayed a depressive effect on the central nervous system (78). In a case series intending to examine the cardiac effects of chamomile, the authors observed that 10 out of 12 patients undergoing cardiac catheterization fell asleep shortly after drinking chamomile tea (44). However, there is limited evidence supporting the sedating effects of chamomile. In human research, significant between-group differences in sleep measures were lacking after chamomile treatment (80).